Dive into a watery world of wonder and create an exciting experience for your group. Journey along the “Waters of the Cape Fear” discovering aquatic environments and wildlife found here in North Carolina and around the world. Explore the Aquarium on a tour, participate in a live animal program or become scientists through hands-on classroom activities or outdoor field experiences. Group rates are available for school groups (out-of-state) and recognized civic organizations. These organizations with 15 or more visiting, qualify for a 15% discount off normal admission, when the group registers in advance and purchases all tickets with one payment. For more information contact our registrar or call 910-772-0542. Children, teachers and staff in North Carolina school groups are admitted to the Aquarium at no charge at the time of the visit if registered in advance. Register early – the Aquarium is a popular destination and reservations are taken on a first-come, first-served basis. The admission fee for registered parent chaperons is $6 per person. 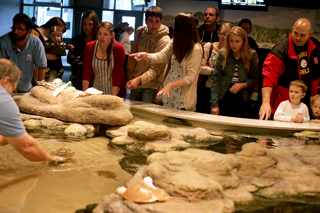 Learn more about Aquarium Field Trips. Engage your crew in more fun with a group activity. Schedule an outdoor adventure, a behind the scenes tour or a live animal program. Learn more about the available activities and schedule your group with an e-mail to [email protected]. Not able to bring your group to the Aquarium? Let us bring the beach within reach and visit your event with an Aquarium Outreach.